Vitamin C or L-ascorbic acid or L-ascorbate is an essential nutrient for humans and certain other animal species. In living organisms ascorbate acts as an antioxidant by protecting the body against oxidative stress. It is also a cofactor in at least eight enzymatic reactions including several collagen synthesis reactions that, when dysfunctional, cause the most severe symptoms of scurvy. In animals these reactions are especially important in wound-healing and in preventing bleeding from capillaries. Ascorbate (an ion of ascorbic acid) is required for a range of essential metabolic reactions in all animals and plants. All species that do not synthesize ascorbate require it in the diet. Deficiency in this vitamin causes the disease scurvy in humans. It is also widely used as a food additive. Vitamin C is purely the L-enantiomer of ascorbate; the opposite D-enantiomer has no physiological significance. When L-ascorbate, which is a strong reducing agent, carries out its reducing function, it is converted to its oxidized form, L-dehydroascorbate. L-dehydroascorbate can then be reduced back to the active L-ascorbate form in the body by enzymes and glutathione. During this process semidehydroascorbic acid radical is formed. Ascorbate free radical reacts poorly with oxygen, and thus will not create a superoxide. Instead two semidehydroascorbate radicals will react and form one ascorbate and one dehydroascorbate. With the help of glutathione, dehydroxyascorbate is converted back to ascorbate. The presence of glutathione is crucial since it spares ascorbate and improves antioxidant capacity of blood. Without it dehydroxyascorbate could not convert back to ascorbate. L-Ascorbate is a weak sugar acid structurally related to glucose that naturally occurs attached either to a hydrogen ion, forming ascorbic acid, or to a metal ion, forming a mineral ascorbate. Ascorbic acid is well known for its antioxidant activity, acting as a reducing agent to reverse oxidation in liquids. When there are more free radicals (reactive oxygen species, ROS) in the human body than antioxidants, the condition is called oxidative stress,and has an impact on cardiovascular disease, hypertension, chronic inflammatory diseases, diabetes as well as on critically ill patients and individuals with severe burns. Individuals experiencing oxidative stress have ascorbate blood levels lower than 45 µmol/L, compared to healthy individual who range between 61.4-80 µmol/L. It is not yet certain whether vitamin C and antioxidants in general prevent oxidative stress-related diseases and promote health. Clinical studies regarding the effects of vitamin C supplementation on lipoproteins and cholesterol have found that vitamin C supplementation does not improve disease markers in the blood. Vitamin C may contribute to decreased risk of cardiovascular disease and strokes through a small reduction in systolic blood pressure, and was also found to both increase ascorbic acid levels and reduce levels of resistin serum, another likely determinant of oxidative stress and cardiovascular risk. However, so far there is no consensus that vitamin C intake has an impact on cardiovascular risks in general, and an array of studies found negative results. Meta-analysis of a large number of studies on antioxidants, including vitamin C supplementation, found no relationship between vitamin C and mortality. It has been known for a long time that ascorbate can behave as a pro-oxidant under certain conditions (e.g. at low concentrations and/or in the presence of free ions of redox-active metals such as copper and iron). Its pro-oxidant behaviour has been regarded as undesirable, as it leads to the formation of ROS or glycated proteins. However, certain pro-oxidant effects of ascorbate can also be advantageous. It has been recently reported that ascorbate promotes protein thiol oxidation in rat liver microsomes. It is thought that a metalloprotein present in the microsomal vescicles oxidizes ascorbate to DHA, which leads to the generation of ROS. ROS, directly or indirectly through membrane tocopherol, oxidizes further ascorbate molecules. DHA formed in or transported into the lumen of the ER can be reduced by protein disulphide isomerase oxidizing the active central dithiols of the enzyme. Oxidized protein disulphide isomerase reacts with reduced attendant proteins yielding protein disulphides and catalytically regenerating protein disulphide isomerase. Although this scheme fits the results gained in microsomal systems in vitro, whether it correctly describes the in vivo situation is still questionable. Further studies are needed to demonstrate the electron transfer in vivo. However, results gained in scorbutic guinea pigs showed that the missing pro-oxidant effect of ascorbate led to ER stress, presumably due to an impairment of oxidative protein folding. Three enzymes participate in collagen hydroxylation. In several cases, hydroxylation is catalysed by Fe(II)-dependent non-haeme oxygenases belonging to the family of α-ketoglutarate (2OG)-dependent dioxygenases. Dioxygenases include prolyl, asparaginyl and lysyl hydroxylases. These reactions add hydroxyl groups to the amino acids proline or lysine in the collagen molecule via prolyl hydroxylase and lysyl hydroxylase, both requiring vitamin C as a cofactor. In several cases, hydroxylation is catalysed by Fe(II)-dependent non-haeme oxygenases belonging to the family of α-ketoglutarate (2OG)-dependent dioxygenases. Oxygen and 2OG are required for oxygenation, which also needs cofactors: Fe2+ and ascorbate. Iron in these enzymes is maintained in the active Fe(II) form by ascorbate. Hydroxylation allows the collagen molecule to assume its triple helix structure, and thus vitamin C is essential to the development and maintenance of scar tissue, blood vessels, and cartilage. Two enzymes are necessary for synthesis of carnitine. Carnitine is essential for the transport of fatty acids into mitochondria for ATP generation. 2. another enzyme adds amide groups to peptide hormones, greatly increasing their stability. Glypicans constitute a family of glycosylphosphatidylinositol-anchored, cell-surface heparan sulphate proteoglycans that are present in lipid rafts and caveolae. They are selective regulators of ligand–receptor interactions and may thereby control growth and development. They can also migrate between the plasma membrane and endomembranes, and can import basic compounds bound to polyanionic heparan sulphate side chains. A member of the family, glypican-1 migrates between the plasma membrane and the Golgi, and vice versa. Cysteines in glypican-1 can be nitrosylated by nitric oxide in a copper-dependent reaction. When glypican-1 is exposed to ascorbate, nitric oxide is released from the intrinsic S-nitroso groups of the glypican-1 core protein. Nitric oxide participates in the deaminative cleavage of heparan sulphate by heparanase at sites where glucosamines possess a free amino group. The NO-catalysed degradation of heparan sulphate begins in early endosomes but mainly takes place in late endosomes. Although these findings are convincing, whether the process is physiologically significant in vivo is still questionable. Further work is needed to clarify the relative contribution of ascorbate-dependent and ascorbate-independent NO formation to the NO-catalysed degradation of heparan sulphate. Migrating glypicans can thus act as potential vehicles for basic compounds (e.g. spermine, basic peptides, etc. ), which may be carried bound to heparan sulphate chains and released from glypican when heparan sulphate is degraded. The mechanism whereby the cargo, glypican and its degradation products are discharged from transporting endosomes is unknown; however, heparan sulphate fragments could potentially form membrane-penetrating complexes with the cargo molecules. The deaminative degradation of glypican-1 heparan sulphate is defective in fibroblasts from patients suffering from Niemann–Pick type C1 disease. Niemann–Pick type C1 disease is a rare neurovisceral degenerative disorder characterized by the accumulation of unesterified cholesterol, sphingolipids and other lipids within the endosomal/lysosomal system. Ascorbate supplementation of the fibroblast restored the deaminative degradation of glypican-1 heparan sulphate. These results suggest that defective processing of glypican-1 can contribute to cell damage in Niemann–Pick C1 disease. Another essential role of ascorbate is related to its functions in redox homeostasis. Because oxidative respiration in mitochondria is a major source of the intracellular production of reactive oxygen species (ROS), the presence of mitochondria and role of vitamin C are of particular interest. 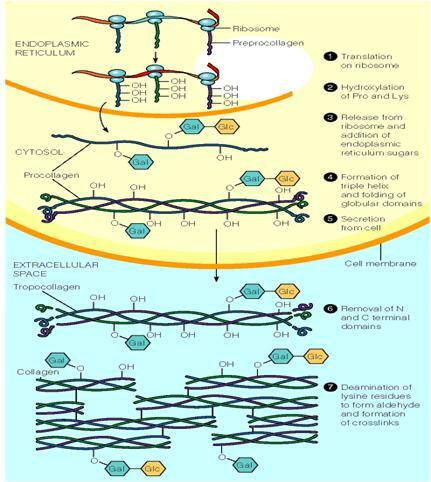 Moreover, the possible functions of ascorbate in oxidative protein folding and in the maintenance of the intralumenal oxidative environment suggest it has a particular role in endoplasmic reticulum (ER)-related processes. In vivo studies showed that ascorbate concentration in mammalian mitochondria can be increased by dietary vitamin C supplementation. However, mitochondrial transport of ascorbate and its intramitochondrial functions are poorly elucidated. Some authors confirmed previous findings that vitamin C enters mitochondria as dehydroascorbic acid (DHA). They found a stereo-selective mitochondrial D-glucose uptake mechanism, which competes with the transport of DHA. Computational analysis of the N-terminal sequences of human GLUT isoforms revealed that GLUT-1 has the highest probability of mitochondrial localization. GLUT-1 in mitochondrial membrane was verified by mitochondrial expression of GLUT1–EGFP, immunoblot analysis and by cellular immunolocalization. Taken together, these observations suggest that, in an analogous fashion to its cellular uptake, vitamin C enters mitochondria in its oxidized state via GLUT-1. Because DHA is very unstable and only ascorbate possesses antioxidant and free radical scavenger properties, DHA taken up or generated in the matrix must be reduced back to ascorbate, otherwise, in physiological conditions, it is lost within minutes. Various mechanisms have been suggested for intramitochondrial ascorbate recycling. It has been reported that mitochondria are capable of reducing DHA to ascorbate in an α-lipoic acid (LA)-dependent manner. The role of reduced GSH in mitochondrial DHA reduction has also been described. The addition of DHA to mitochondria resulted in a reduction of DHA and a mitochondrial accumulation of ascorbate. Ascorbate levels in mitochondria reached millimolar concentrations. Mitoplasts were also capable of taking up and reducing DHA. Thioredoxin reductase in mitochondria could also reduce DHA. However, as no significant decrease in DHA reduction was detected in mitochondria isolated from selenium-deficient animals, this is likely to be a small component in the mitochondrial DHA reduction machinery. DHA loading caused a significant decrease in mitochondrial GSH concentration. Depletion of mitochondrial GSH content caused significant impairment of DHA reduction to ascorbate. Based on these results, it has been suggested that the GSH-dependent reduction of DHA is one of the major ascorbate-producing reactions in mammalian mitochondria. The observation, that in the absence of respiratory substrates, liver mitochondria lose their ability to maintain or increase the level of ascorbate, suggests that the respiratory chain contributes to the reduction of DHA. Indeed, it was shown that the formation of ascorbate from DHA could be enhanced by several respiratory substrates (succinate, malate and glycerol-3-phosphate). Using specific inhibitors of the mitochondrial electron transport chain, the site of ascorbate sparing was localized to complex III. A recent study on guinea pig muscle mitochondria showed that although DHA transport was present, mitochondrial ascorbate accumulation could not be inhibited by GLUT-1 inhibitors, and the depletion of mitochondrial GSH was also absent. This phenomenon is hard to explain, because the reduction of DHA by GSH is a well-documented chemical reaction (e.g. it also takes place in the absence of any DHA-reducing enzyme). The lack of the effect of GLUT-1 inhibitors was explained by the differences between the sources of mitochondria in the two studies (human vs. guinea pig, and cell culture vs. tissue). On the other hand, a marked increase in the rate of DHA reduction upon addition of succinate was observed. These data and similar results obtained in plant mitochondria underline the universal role of the mitochondrial electron transfer chain in DHA reduction. Ascorbate can transmigrate between the outer and inner membrane, which raises the possibility that mitochondria contribute not only to DHA reduction, but also to the capacity of the whole cell to produce ascorbate. The involvement of the electron transfer chain in DHA reduction can contribute to the stabilization of the mitochondrial redox balance in at least two ways. Firstly, through the donation of electrons to DHA reduction, it can decrease the reduced state of the electron transfer chain. In this way, the electron leakage of the electron transfer chain and subsequent ROS formation can be also decreased. Secondly, the production of ascorbate provides reduced vitamin C, which can scavenge ROS directly at the site of their generation. The maintenance of the intramitochondrial ascorbate level seems to have a notable anti-apoptotic effect. The elevated level of ROS can induce the collapse of the mitochondrial membrane potentially leading to apoptosis. In HL-60 cells exposed to hydrogen peroxide, pre-incubation with DHA reduced the intracellular peroxide levels in a dose-dependent manner. In accordance with this phenomenon, the mitochondrial membrane potential was also partially conserved, and the denaturation and mitochondrial release of cytochrome c could also be avoided in DHA-pretreated cells. In a study involving FAS-induced apoptosis of monocytes, the loss of the mitochondrial membrane potential could be inhibited by pretreatment with vitamin C. During hypoxia and reperfusion, the electron transfer chain, especially complex III, is a primary site of ROS formation and a target of injury in the vascular endothelium. A dose-dependent reduction of ROS could be observed in response to vitamin C in human umbilical vein and coronary artery endothelial cells subjected to hypoxia–reperfusion. The release of cytochrome c was also prevented and the mitochondrial membrane potential was stabilized by vitamin C in cells undergoing hypoxia–reperfusion. All these events led to a decreased activation of caspase-9 and caspase-3 with resultant inhibition of apoptosis induced by hypoxia–reperfusion. These findings suggest that mitochondrial vitamin C is a major component in the maintenance of the mitochondrial membrane potential, and that vitamin C exerts its anti-apoptotic effect through its ability to scavenge ROS. Following oxidative stress, a 3- to 10-fold increase in damage can be found in mitochondrial DNA (mtDNA) compared to that in nuclear DNA. Some authors showed that mitochondrial ascorbate could protect mtDNA against oxidative damage. It was clearly demonstrated that ascorbate protected mtDNA against the ROS-induced elevation of 8-oxo-dG and apurinic/apyrimidic sites. Furthermore, pretreatment with ascorbate significantly attenuated the hydrogen peroxide-induced shearing of mtDNA. In accordance with these findings, in cells from the retinal pigment epithelium, vitamin C was found to induce a significant reduction of hydrogen peroxide-induced lesions in mtDNA. Increased production of free radicals and ROS has been observed in various mitochondrial diseases. Supplementation with vitamin C is part of the treatment of mitochondrial diseases as it alleviates oxidative stress. Indeed, the elevated level of superoxide production – observed in fibroblasts from patients with electron transport chain deficiencies – could be decreased by ascorbate treatment. The activities of I–III and II–III complexes have also been found to be stimulated simultaneously by the addition of vitamin C to the culture media. Hence, there have been attempts to use vitamin C as a therapeutic agent in the treatment of various mitochondrial diseases. Vitamin C and menadione treatment of a young woman with mitochondrial myopathy and severe exercise intolerance was expected to bypass the block in complex III, because the redox potentials of these electron carriers fit the gap created by the cytochrome c dysfunction. However, after an initial improvement documented by 31P nuclear magnetic resonance spectroscopy of muscle, this state was not sustained [menadione had to be discontinued because of its withdrawal by the Food and Drug Administration]. Unfortunately, the use of vitamin C as an effective treatment for other patients suffering mitochondrial diseases has not been reported. Ascorbate metabolism and the ER are closely related to each other from several aspects. Firstly, the last steps of ascorbate synthesis are localized in the ER. Secondly, because ROS-generating reactions (e.g. oxidative protein folding) reside in this compartment, the antioxidant effect of ascorbate is presumably essential in the ER. Finally, several luminal enzymes of the secretory pathway use ascorbate as a cofactor. L-Gulonolactone oxidase (GLO), a microsomal enzyme, catalyses the aerobic conversion of gulonolactone to ascorbate, accompanied by the production of hydrogen peroxide. The requirement of detergents for the solubilization of GLO from microsomal vesicles strongly suggests it is located in the membrane. The amino acid sequence of GLO contains several strongly hydrophobic regions forming β-sheets rather than a typical transmembrane helical structure, which are possibly associated with the ER membrane. The orientation of the catalytic site towards the lumen of the ER is indicated by the intraluminal accumulation of ascorbate and preferential intraluminal GSH oxidation (presumably by hydrogen peroxide) in rat liver microsomes incubated with gulonolactone. This observation suggests that ascorbate produced by the liver enters the circulation – at least partly – through this secretion pathway. It should be noted that the mentioned processes are only valid in ascorbate-synthesizing species. However, in GLO-deficient species including humans, effective transport mechanisms facilitate ascorbate influx into the ER lumen. Although the exact concentration of ascorbate in the ER lumen is unknown, local synthesis (in the case of the liver) and the high demand by luminal ascorbate-dependent enzymes (Fe2+/2OG-dependent dioxygenases: prolyl-3-hydroxylase, prolyl-4-hydroxylase and lysyl hydroxylase) suggest that the concentration of ascorbate is higher here than in plasma or cytosol. Consistent with this assumption, the vesicular structures of the secretory pathway are characterized by high (millimolar) ascorbate concentrations, which are necessary for the functioning of Cu+-dependent monooxygenases such as peptidylglycine α-amidating monooxygenase and dopamine β-hydroxylase. The ER is equipped with powerful electron transfer chains. During the redox cycle of the cytochrome P450 system, ROS can be formed in the ER membrane as a result of ‘chemical accidents’. The terminal oxidase of the oxidative protein folding (Ero1) generates hydrogen peroxide in the lumen. A high local concentration of ascorbate is probably important to balance these pro-oxidant events. It is very hard to summarize the therapeutic benefits of vitamin C because: (i) ascorbate is added mainly in different combinations with various other drugs, antioxidants or other (natural) antioxidant diet constituents; (ii) the data obtained and the conclusions reached are sometimes contraversial; (iii) there is disagreement among physicians regarding the therapeutic use of ascorbate in everyday treatment; (iv) in several cases, very small differences are registered and the number of patients participating in these studies is very limited; and (v) there are major differences with respect to the oral and intravenous use of ascorbate. Ascorbate added intravenously is much more effective in elevating serum ascorbate levels, while several randomized clinical trials that have utilized oral administration of ascorbate have been unsuccessful. In humans, the requirement for vitamin C is satisfied by natural sources and vitamin C supplements in the ordinary diet. There is continuing debate within the scientific community over the best dose schedule (the amount and frequency of intake) of vitamin C for maintaining optimal health in humans. A balanced diet without supplementation usually contains enough vitamin C to prevent scurvy in an average healthy adult, while those who are pregnant, smoke tobacco, or are under stress require slightly more. However, the amount of Vitamin C necessary to prevent scurvy is less than the amount required for optimal health, as there are a number of other chronic diseases whose risk are increased by a low vitamin C intake, including cancer, heart disease, and cataracts. A 1999 review suggested a dose of 90–100 mg Vitamin C daily is required to optimally protect against these diseases, in contrast to the lower 45 mg daily required to prevent scurvy. High doses (thousands of milligrams) may result in diarrhoea in healthy adults, as a result of the osmotic water-retaining effect of the unabsorbed portion in the gastrointestinal tract (similar to cathartic osmotic laxatives). Several individuals and organizations advocate large doses of vitamin C in excess of 10–100 times RDI in the form of oral or intravenous therapy. Large, randomized clinical trials on the effects of high doses on the general population have never taken place. Arguments for megadosage are based on the diets of closely related apes, the hypothesized diet of prehistoric humans, and that most mammals synthesize vitamin C rather than relying on dietary intake. Linus Pauling spent much of the later part of his life advocating for the use of megadose vitamin C and believed the established RDA was sufficient to prevent scurvy, but not necessarily the dosage for optimal health. Megadoses have been promoted for the treatment or prevention of various conditions, including cancer and coronary disease. These uses are not supported by clinical evidence, and in some cases harm may result. Relatively large doses of ascorbic acid may cause indigestion, particularly when taken on an empty stomach. However, taking vitamin C in the form of sodium ascorbate and calcium ascorbate may minimize this effect. When taken in large doses, ascorbic acid causes diarrhoea in healthy subjects. There is a longstanding belief among the mainstream medical community that vitamin C causes kidney stones. Some case reports exist for a link between patients with oxalate deposits and a history of high-dose vitamin C usage. In a study conducted on rats, during the first month of pregnancy, high doses of vitamin C may suppress the production of progesterone from the corpus luteum. By blocking this function of the corpus luteum, high doses of vitamin C (1000+ mg) are theorized to induce an early miscarriage. In a group of spontaneously aborting women at the end of the first trimester, the mean values of vitamin C were significantly higher in the aborting group. However, the authors do state: 'This could not be interpreted as an evidence of causal association. Plasma concentrations of vitamin C are tightly controlled when the vitamin is taken orally. Peak plasma vitamin C concentration seemed to plateau with increasing oral doses. There are two simple reasons for this: on the one hand, the capacity of the transporters is limited; on the other hand, the two Na+-dependent transporters (SVCT1 and SVCT2 which import the reduced form of ascorbate) can be subjected to fine-tuned regulation by their own substrate. An elevated level of ascorbate in the intestinal lumen led to down-regulation of SVCT1 mRNA in enterocytes. A similar self-regulatory role for ascorbate was demonstrated for SVCT2 in platelets. Recently, it was shown that skeletal muscle cells modulated the expression of the SVCT2 carrier according to their redox balance. Both mRNA and protein levels of SVCT2 were up-regulated in hydrogen peroxide-treated myotubes, while antioxidant supplementation with LA lowered the expression of SVCT2. It seems likely that the redox state of the cell can influence the expression of SVCT 2 and in this way, the resulting response regulates the transport and intracellular level of ascorbate. Plasma levels of vitamin C are not only limited by absorption, but also by reabsorption in the kidneys by SVCT1. Accordingly, the maximum bioavailability of vitamin C is usually attained at lower doses and declines with the elevation of oral supplements: 87% for 30 mg, 80% for 100 mg, 72% for 200 mg, 63% for 500 mg and less than 50% for 1250 mg. This observation was further confirmed by data from the three-compartment pharmacokinetic model for vitamin C. On the basis of this model, a single oral dose of 3 g – the maximum tolerated single dose – produces a peak plasma concentration of 206 µM, while the 1.25 g oral dose results in just a slightly lower concentration of 187 µM. Finally, for 200 mg – an amount obtained from vitamin C-rich foods – a peak-predicted concentration was approximately 90 µM. Hence, pharmacological plasma concentrations of vitamin C can only be reached through the intravenous administration of the vitamin. The only clinical benefit of ascorbate addition, with a proven mechanism of action, is the prevention of scurvy. However, intake of as little as 10 mg·day−1 of vitamin C is appropriate for this purpose. This amount results in plasma vitamin C concentrations below 10 µM. In cases of ‘therapeutic’ levels, or even ‘normal’ levels, of vitamin C in the diet, plasma ascorbate concentrations are at least one order of magnitude higher than that necessary to prevent scurvy. Scurvy is an avitaminosis resulting from lack of vitamin C, since without this vitamin, the synthesised collagen is too unstable to perform its function. Scurvy leads to the formation of brown spots on the skin, spongy gums, and bleeding from all mucous membranes. The spots are most abundant on the thighs and legs, and a person with the ailment looks pale, feels depressed, and is partially immobilized. In advanced scurvy there are open, suppurating wounds and loss of teeth and, eventually, death. The human body can store only a certain amount of vitamin C, and so the body stores are depleted if fresh supplies are not consumed. The time frame for onset of symptoms of scurvy may range from one month to more than six months, depending on previous loading of vitamin C.
Nobel prize winner Linus Pauling and G. C. Willis have asserted that chronic long term low blood levels of vitamin C ("chronic scurvy") is a cause of atherosclerosis. Notable human dietary studies of experimentally-induced scurvy have been conducted on conscientious objectors during WW II in Britain, and on Iowa state prisoners in the late 1960s. These studies both found that all obvious symptoms of scurvy previously induced by an experimental scorbutic diet with extremely low vitamin C content could be completely reversed by additional vitamin C supplementation of only 10 mg a day. In these experiments, there was no clinical difference noted between men given 70 mg vitamin C per day (which produced blood level of vitamin C of about 0.55 mg/dl, about 1/3 of tissue saturation levels), and those given 10 mg per day. Men in the prison study developed the first signs of scurvy about 4 weeks after starting the vitamin C free diet, whereas in the British study, six to eight months were required, possibly due to the pre-loading of this group with a 70 mg/day supplement for six weeks before the scorbutic diet was fed. Men in both studies on a diet devoid, or nearly devoid, of vitamin C had blood levels of vitamin C too low to be accurately measured when they developed signs of scurvy, and in the Iowa study, at this time were estimated (by labeled vitamin C dilution) to have a body pool of less than 300 mg, with daily turnover of only 2.5 mg/day, implying a instantaneous half-life of 83 days by this time (elimination constant of 4 months). Moderately higher blood levels of vitamin C measured in healthy persons have been found to be prospectively correlated with decreased risk of cardiovascular disease and ischaemic heart disease, and an increase life expectancy. The same study found an inverse relationship between blood vitamin C levels and cancer risk in men, but not in women. An increase in blood level of 20 micromol/L of vitamin C (about 0.35 mg/dL, and representing a theoretical additional 50 grams of fruit and vegetables per day) was found epidemiologically to reduce the all-cause risk of mortality, four years after measuring it, by about 20%. However, because this was not an intervention study, causation could not be proven, and vitamin C blood levels acting as a proxy marker for other differences between the groups could not be ruled out. However, the four-year long and prospective nature of the study did rule out proxy effect from any vitamin C lowering effects of immediately terminal illness, or near-end-of-life poor health. Studies with much higher doses of vitamin C, usually between 200 and 6000 mg/day, for the treatment of infections and wounds have shown inconsistent results. Combinations of antioxidants seem to improve wound healing. J Mandl, A Szarka and G Bánhegyi, 2009, Vitamin C: Update on physiology and pharmacology, Br J. Pharmacology. Padayatty, Sebastian J.; Katz, Arie; Wang, Yaohui; Eck, Peter; Kwon, Oran; Lee, Je-Hyuk; Chen, Shenglin, 2006-08-01, Retrieved 2007-08-03 Vitamin C (Ascorbic acid), MedLine Plus. Corpe, Christopher et al., 2003, Vitamin C as an antioxidant: evaluation of its role in disease prevention, Journal of the American College of Nutrition 22,18–35. MedLine Plus. National Institute of Health, 2006-08-01, Vitamin C (Ascorbic acid). Vitamin C deficency can lead to iron deficiency anaemia, a condition that causes the symptoms of tiredness, shortness of breath and a lack of energy, in which the availability of intracellular iron is reduced. Vitamin C affects hematopoiesis by enhancing the absorption of iron from the small intestine by reducing dietary iron from the ferric form to the ferrous form. Vitamin C (VitC) plays a critical role in the maintenance of a normal mature collagen network in humans (anti-scurvy properties) by preventing the auto-inactivation of lysyl and prolyl hyroxylase, two key enzymes in collagen biosynthesis. VitC induced a dose-dependent increase in collagen type I deposits by normal human fibroblasts (NHF) cultured in monolayer, and enhanced extracellular matrix contraction by NHF in a lattice model, in a non-cytotoxic range of concentrations (103m, 104m, 105m). Exogenous VitC supply could thus contribute to the maintenance of optimal collagenic density in the dermis and locally strengthen the collagen network. Collagen has unusual amino acid composition. It contains large amounts of glycine and proline, as well as two amino acids that are not inserted directly by ribosomes- hydroxyproline and hydroxyllysine. deficiencies may cause scurvy, a disease that can lead to loss of teeth and easy bruising caused by reduction in strength of connective tissue due to lack of collagen or defective collagen. The typical pathologic manifestations of vitamin C deficiency, including poor wound healing, are noted in collagen-containing tissues and in organs and tissues such as skin, cartilage, dentine, osteoid, and capillary blood vessels. Collagen fibres consist of globular units of the collagen, sub-units of tropocollagen. Tropocollagen subunits spontaneously arrange themselves under physiological conditions into staggered array structure stabilized by numerous hydrogen bonds and covalent bonds.